Queen Nefertari was the first of the royal wives of King Ramses II. Her name means “The Beautiful Campaign”. 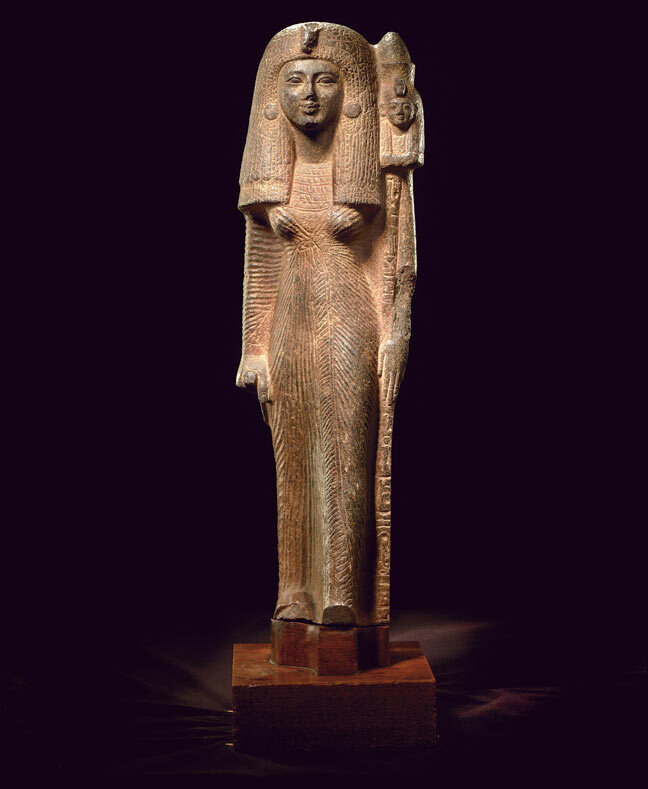 She had also another name Nefertari Meritmut, which means “The Beloved of the Goddess of Mut”. Nefertari is considered a great Egyptian Queen just like Cleopatra, Nefertiti, and Hatshepsut as she had a great impact on the ancient civilization of Egypt. She was a very educated queen and could both read and write hieroglyphics. She used these unique skills in diplomatic works. Her tomb in Valley of the Queens is considered the largest and most spectacular. She has also a temple of hers constructed by Ramsses II at Abu Simbel next to his colossal monument. There isn’t much information about the childhood of Nefertari, there is an inscription in her tomb, which links her to pharaoh Ay but Nefertari can’t be the daughter of Ay. There is also no evidence to link Queen Nefertari to the Royal family of the 18th century. She married Ramsses II when she was only 13 years old and he was 15 years. She was a noblewoman but not a member of the Royal Family. Ramsses II married about seven different queens and Nefertari was the first of them. He ruled Egypt for sixty-seven years, lived for ninety years, and had at least forty daughters and forty-five sons. Nefertari was Ramsses’ wife for about 24 years. Ramsses really loved Nefertari as he honored her with tombs and temples. There are statues of the Queen Nefertari at the foot of giant statues of King Ramses II in Luxor. Nefertari had a great importance in the capital city of the Hittites as Ramsses II had a war with the Hittites but a treaty was signed in his reign with them. Nefertari bought some gifts of the king and the queen of the Hittites including a golden necklace and some letters. Nefertiti was Ramesses II’s first wife. She ruled for twenty-four years. The tomb of Queen Nefertiti is the most beautiful tomb in the Valley of the Queens. Love poetry has been found inside her tomb that was written by Ramsses II. A small temple was dedicated to Nefertiti and Hathor by Ramsses II. There are many titles of Queen Nefertari includes Great of Praises, Sweet of Love, Lady of Grace, Great King’s Wife, his beloved, Lady of The Two Lands, Lady of all Lands, Wife of the Strong Bull, God’s Wife, Mistress of Upper and Lower Egypt and she was also called “The one for whom the sun shines” by Ramsses II. Ramsses II loved Nefertari so much that he built her a very beautiful tomb in the Valley of the Queens that you can visit during your Egypt tour packages. It is the largest one in the valley. Thieves stole all things that were in the tomb including the mummy of Nefertari and her grave goods. Some of the paintings inside the tomb depict Nefertari wearing a crown, which is associated with the goddess Isis and Hathor. The paintings inside the tomb show Nefertari honors her goddess so that they help her in her journey in the afterlife. The ceiling of the tomb has a blue color with some stars. Nearly all paintings on the walls of the tomb were preserved and Egyptologists did their best to protect those decorations and the Egyptian government tries to limit the number of visitors to the cave. Inside the tomb, there are some messages from the Book of the Dead plus some Hieroglyphics. The tomb of Nefertiti is considered a Key Cultural Image for two reasons: first, it tells scholars about the beauty and the color of the ancient Royal Tombs. Second, it shows the building expertise of artisans who lived during the reign of Ramses II. Ramses II has built the temple of Abu Simbel in Nubia. There are some images of Queen Nefertari and her royal children inside the great Temple of Ramsses. The temples of Abu Simbel have been moved in 1960, as the Egyptian government was afraid from the flooding that was caused by the High Dam, you also can witness the temple onboard Egypt Nile cruise. The small Temple of Abu Simbel was dedicated to Nefertari and goddess Hathor by Ramsses. In front of the temple, there are two colossal statues of the queen and four of Ramses II in addition to some small statues of the Royal children next to the colossal statues. There is also a huge hypostyle hall inside the temple that includes; columns that have tops carved in the shape of Hathor’s head. There is also a sanctuary that is located on the opposite side of the entrance. It is believed that Queen Nefertari died after a short period from the construction of Abu Simbel.